I noticed there was a lack of bedtime book for Latino parents living in the United States. I feel very strongly that as we Latinas raise our children in the US between two cultures, we must keep our traditions and folklore alive and pass them on to our young. It is the way to give children roots, specially as they learn to cherish the language and culture of the United States. 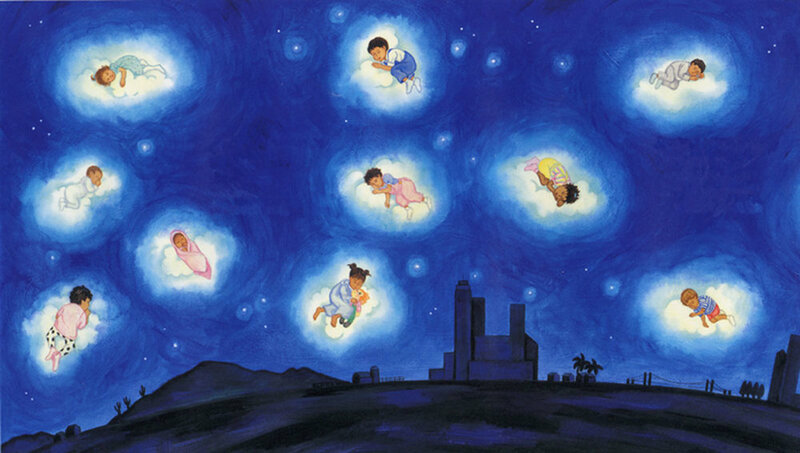 This collection of well-known lullabies and gentle games has been carefully conceived. The research for the songs started as I poured over anthologies, reminisced with relatives and friends, and finally crafted a survey intended to be answered by Latinas of all walks of life from all across America. Seventy-five women from 14 different Latin American countries, answered my survey. As I read their responses, I sometimes discovered charming new versions of a lullaby or game. I ended arranging the material so it could be enjoyed in one seating. Once I had the final selection, I went to my local library to share them with parents and children during “cuddle up hour.” To see parents and toddlers of all ethnicities enjoying the inherited lore of so many of us living now in the USA, was priceless. I spent a long time thinking how best to illustrate this collection. Eventually I realized that what I wanted to show was that there are all sorts of Latinos embedded in the American fabric. I spent two years sketching mothers and their babies. I visited Latino markets, Latino neighborhoods, parks, public libraries, and schools. I have pictures of Latinas working in the strawberry fields, out shopping, in the art museum or the park. One winter day that I was driving home I saw a beautiful mother crossing the avenue. Her dark hair woven into a tight braid fell across her back, reaching past her flimsy sweater. She had a long black skirt sprinkled with red flowers and in her arms held a baby swaddled in a pink blanket. She looked out of place, dressed in Guatemalan garb, standing on the snowy sidewalk. I made a u-turn, parked and walked towards her. Introduced myself I and asked for permission to take her picture. She embodied what I wanted to portray in this book, Latinas of all social classes and origins and shades, united in the love for our children and heritage. The photographs I took and sketches I made, helped me create the art. First, I primed bristol board with gesso. Then, I gave texture to the background with broad brush strokes. Finally, I applied a base color before I started painting in oil washes thinned with turpentine. I wanted richness in texture and depth in color; mimicking with my technique what I imagined was the lives of these women. I paid close attention to the facial expressions and body gestures of my characters in order to portray the strong bond that occurs between mother and child as they are enveloped in a game or lullaby. Each picture is a glimpse of an intimate moment between parent and child.